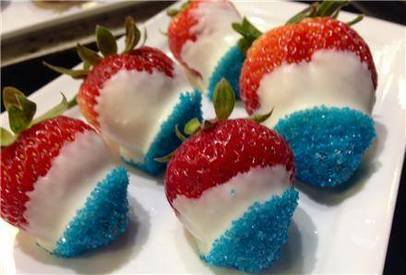 Red white & blue strawberries! With Saturday being Indepencence Day, this picture just perked up my tastebuds! Now when I found this, there wasn't a recipe link attached. Being experienced in Chocolate Tempering, I think we can figure out how to make these. Now, do you really need a recipe for this? I think not.